THOSE willing to do the hard yakka with a minimum of fuss and a maximum of effort are so often among the most important performers in any team environment. They mightn’t necessarily the loudest, or the ones who stand out the most. But they can generally be relied upon to get the job done. Michael Taylor, Collingwood’s ever-reliable, ever-resilient footballer of the early-to-mid 1980s, neatly fits that bill. Never mind the fact that his time as a Magpies player was fleeting when compared to other higher-profile teammates, nor that so many of his personal honours came from his more lasting football home, Norwood. That doesn’t alter the fact that Taylor was – and remains – a much-loved figure in Collingwood’s history. Taylor was already an established SANFL star when he crossed to the Magpies for what was meant to be one season on lease. But he loved Collingwood so much that he ended up staying four seasons, playing 92 of a possible 95 games between 1981 and 1984. And he would later return to assist the club in a different guise, playing a support role in one of Collingwood’s finest hours. Michael Taylor was brought up on his family’s sheep and cattle farm near Reedy Creek, on South Australia’s Limecoast region. The self-confessed “quiet achiever” was one of only four kids in his class at the local school and would detail how he had to travel to play with Kingston when Reedy Creek’s footy team folded. It was from his time at Kingston that he came by the nickname that would stick with him during his footy days – ‘Kingo’. As a 15-year-old, he moved to Adelaide to join Norwood. In his first nine seasons there he won an astonishing five best-and-fairests and two flags, the second as captain in 1978. A record like that obviously attracted interest from across the border, and after the 1980 season, the rising 27-year-old made a decision that he wanted to play a season in the VFL. Having had interest from Hawthorn and Carlton, he ultimately chose Collingwood. Taylor settled in quickly, playing 24 matches in his first season, as Hafey and his Magpies made it through to the Grand Final against Carlton. The Magpies lost, but Taylor performed well on the big stage. He won the club’s most determined player in his debut year. His form improved even further in the following years, finishing runner-up in both the 1982 and 1983 Copeland Trophies. His teammates also loved him, lauding his quietly-spoken leadership qualities. Taylor often helped to drive the training standards at Victoria Park. He fitted perfectly into a defensive role the longer he remained at the club. 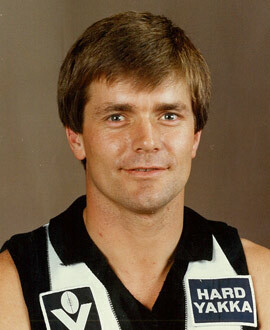 After the Magpies bowed out with a flogging in the 1984 preliminary final, Taylor returned home to South Australia – and to Norwood, where he ended up winning a sixth best-and-fairest – a feat that saw the club eventually name the award after him. But a phone call from Collingwood ahead of the 1988 season saw him end his SANFL career and shift back to Melbourne to become Leigh Matthews’ assistant coach. He also offered to keep playing in the reserves to help teach the younger players. His form was so good there that, even at 34 years of age, he was seriously close to a senior recall. Taylor played a significant role in helping to develop so many of the young Magpies who helped break a 32-year premiership drought in 1990. It was his third and final season as Matthews’ assistant coach. After that, he became an assistant to Graham Cornes with the inaugural Adelaide Crows team, and when Cornes left, it was understood that many of the players wanted him to be the successor. Sadly, that never happened. But Taylor accepted the decision with the same grace and dignity that he displayed across his entire career.